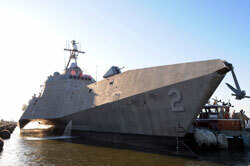 According to the report, ‘FFG(X) Program: Background and Issues for Congress,’ dated 4 February 2019, which was compiled by CRS Specialist in Naval Affairs Ron O'Rourke, the US Navy’s desire to procure the first FFG(X) in FY2020 does not allow enough time to develop a completely new design, as a result of which, it intends to build the FFG(X) to a modified version of an existing ship design – an approach called the parent-design approach. The parent design could be a US ship design or a foreign ship design. Multiple industry teams are competing for the programme. Mr O’Rourke’s report for the Congressional Research Service said the FFG(X) programme presents several potential oversight issues for Congress, including whether to approve, reject, or modify the Navy’s FY2019 funding request for the programme; whether the US Navy has accurately identified the capability gaps and mission requirements to be addressed by the programme; and whether it has demonstrated that procuring a new class of FFGs is the best or most promising general approach for addressing the identified capability gaps and mission needs. Other questions about the programme include whether the US Navy has chosen the appropriate amount of growth margin to incorporate into the FFG(X) design; and whether the decision to use a parent-design approach rather than develop an entirely new design is the right one. Mr O’Rourke said another potential oversight issue for Congress is whether the FFG(X) programme has any implications for required numbers or capabilities of US Navy cruisers and destroyers. The US Navy has begun work to scope requirements for a new generation of optionally-manned and unmanned surface vehicles as part of its evolving Future Surface Combatant Force architecture. Technology maturation work completed to date under the US Navy’s Surface Capability Evolution Plan has identified a Future Surface Combatant Force (FSCF) mix which would include a Medium Unmanned Surface Vehicle (MUSV) and a Large Unmanned Surface Vehicle (LUSV) alongside a Large Surface Combatant, a Small Surface Combatant and a common Integrated Combat System. The US Navy has developed broad requirements for two classes of unmanned surface vessel: the MUSV is a Class 3 platform (between 12m and 50m in length); the LUSV will be a Class 4 hull (>50m in length) fitted with organic sensors and able to carry distributed weapon payloads. Specific attributes of the MUSV include: an endurance of 4,500nm or more at 16knot transit speed or higher (including maintaining a 10% fuel reserve); a sustained speed of 24knot (threshold) or more (27knot + objective) in calm water; capable of using NATO F-76 fuel (objective is to use either F-76 or NATO F-44); remaining operational in Sea State 4 or higher; surviving in Sea State 5 or higher; and capable of operating for 60 days (threshold) or more (90 days objective) without any manned maintenance. Power generation capacity is set at between 300kW (threshold) and 500kW (objective). In terms of deck estate, topside space and a sufficiently reinforced deck is required to support one standard ISO 40ft shipping container and one standard ISO 20 ft shipping container, laden to normal maximum weight. These can be adjacent to each other or separate from each other.